Times are pretty tough for INDEPABIS, our (sort of) Consumer Protection Agency. With the current wave of shortages, they’re way, way overstretched. Now, a major corruption scandal involving a high-ranking director could make things much worse for its staff. An internal purge could soon follow, as hinted by Commerce Minister Alejandro Fleming. The head of the agency Consuelo Cerrada was kicked out and Nicolás Maduro has brought back Eduardo Samán to take over. Who is he? 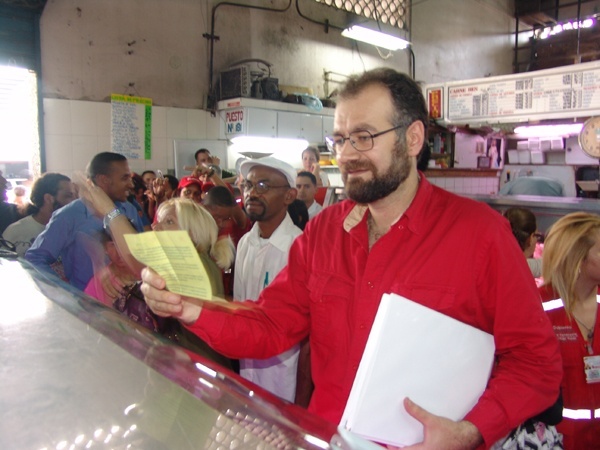 For those who haven’t had the pleasure of knowing him, let me put it this way: if INDEPABIS is our own Vampire Hunting Department, Samán would be the criollo equivalent of Van Helsing, a guy who’s in the outermost fringes of chavista radicalism, who never saw a private company he didn’t want to come down on for … practically anything. Recently, he was looking to be Chavismo’s candidate for Metropolitan Mayor of Caracas, but some inside the PSUV didn’t like that idea. Now he’s back on the post that that made him well-known. He defines himself as “ultra-leftist” and kinda loves the media spotlight. He’ll surely double down on surprise inspections, but this time markets and warehouses won’t be enough for him. So Food Minister Félix Osorio has an idea: screw it, let’s check people’s homes, because that’s where the real “domestic hoarding” is happening.